The Braid-Cut™ HD is the heavy-duty version of our standard Braid-Cut™ MT. It is designed for larger outer diameter hose up to 50 mm OD maximum. This advanced machine cuts through stainless braided hose cleanly, using an integral welding head to fuse the wire ends together. Elkonite® Tungsten Copper alloy electrode jaws clamp the hose while the toothless circular blade cuts through. The Braid‐Cut™ HD is fully PLC controlled, with an advance program to ensure total synchronisation between the welding & cutting. 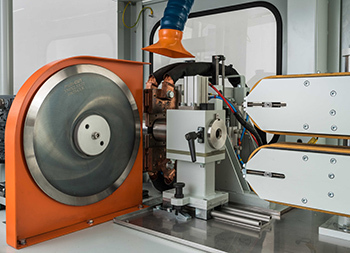 A range of Braid-Cut™ HD cutters are available, with maximum OD capacity sizes of 40 mm & 50 mm.